How much Trash will fit in my Front-Load container? On average 14-16 standard household 13gallon drawstring trash bags will fit in the container per yard. 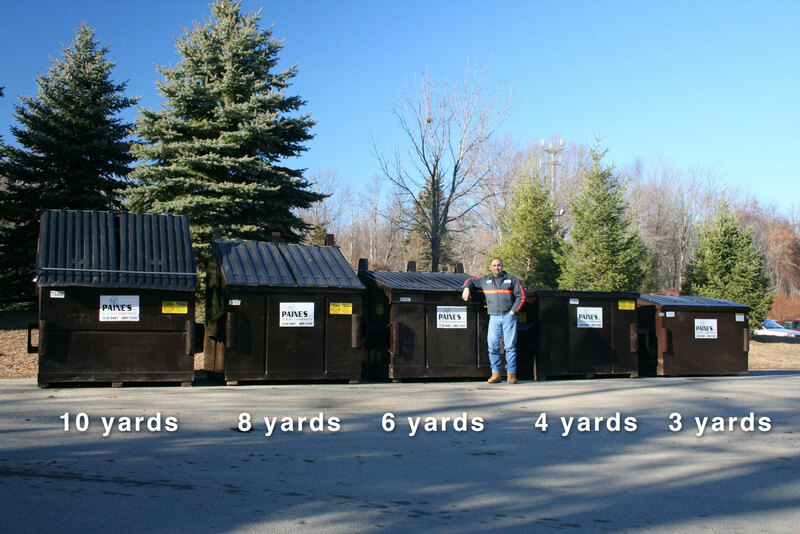 For example a 2 yard dumpster is equivalent of four 95 gallon automated barrels. Our helpful sales department is happy to review your onsite waste production and make recommendations as to the size and frequency of empties need at your business. How much Recycling will fit in my Front-Load container? On average 14-16 standard 13gallon containers worth of material will fit per yard. Don’t forget when it comes to recycling plastic bags should not be used and breaking down items will allow more to fit in your container. Our helpful sales department is happy to review your onsite recycling production and make recommendations as to the size and frequency of empties need at your business. How much room is needed to put a Front-Load container in place? All Front-Load containers are 71- ¾’’ wide but containers vary in height and depth depending on the size and style. Please note this does not include the container sleeves or room for the truck to maneuver and collect the containers contents. Please call us and speak with one of our helpful sales representatives who can help determine what will work best at your location. There are many factors to consider when building an enclosure for your waste and recycling containers. Due to things like power lines, trees and truck maneuverability we suggest contacting us as soon as possible before installing your enclosure. Yes! Please let us know right away if you would like your dumpster to be fitted with a lock and locking bar. These need to be installed by our maintenance department. Can a Front-Load dumpster damage my businesses driveway? These containers are heavy and are picked up by a very heavy truck because of this any paved location could potentially become damaged. It is recommended that our sales department do a site visit to help determine the best location for your Front-Load dumpster. As always our professional skilled drivers are trained to be on the lookout for hazards, concerns and aim to protect your property from damage. A damage waver may be needed in some situations. How much notice is required to set up an account and get containers delivered to my business? An account can be set up and dumpsters delivered in just a couple of business days. For businesses that require special order containers, vertical pack machines or compactors it may take longer due to the uniqueness of the location and instillation. A timeline would be discussed with one of our Sales representatives in advance. Yes, a service agreement protects not only Paine’s but our customers as well. How do I choose the right size and style container for my business needs? Each business is different and has diverse needs, because of this we ask that you give one of our friendly sales representatives a call. They will be happy to go over your needs and make recommendations on sizes, styles and frequencies of empties. What happens if my container becomes damaged? If the damage is caused by normal wear and tear Paine’s will determine the best course of action to get it repaired. Some repairs require containers to be brought back to our shop while other repairs can be done on site. If the damage is caused by vandals or human error we ask that a police report be filed. There may be a fee associated with the repair. Climbing on or in a container? Never climb on or in the containers. The material inside might be sharp or slippery and cause injury. How high can I load my Front-Load containers? Never load the container above the sides/lids. It is our responsibility to safely empty material into the truck for transport. If the container is overloaded, material could fall off during emptying and damage our vehicle, enclosures or worse your customer’s vehicles. How close can my customer’s park to the containers? Please do not park vehicles near the container. Vehicles could be damaged as a result of the activities that occur near this equipment. Also, service could be delayed or an attempt fee could be levied if the container is blocked. How do I handle snow and my Front-Load container? Snow although beautiful at times can definitely get in the way when it comes to Front-Load containers and enclosures. Snow and ice should be thoroughly removed from in front of and leading up to any containers. Don’t forget that snow should always be removed from inside enclosures as well. Even though the trucks are big they do not handle well in/on snow and ice. Making sure your snow removal company is aware that piles of snow and ice in front of containers can pose a dangerous situation or could prevent collection. What can I NOT put in my Front-Load container? Each business should review with the Paine’s Sales Department what they plan to dispose of. This helps to clear up any misunderstandings before issues arise. The following is a generic list of items not accepted in Front-Load containers. If you have a specific question please call us, we are happy to help. What can I put in my Front-Load container? Regularly produced trash that is not bulky material, recyclable or hazardous belongs in the trash Front-Loader container. This includes bag-able items like product packaging, foam containers & soiled items. Regularly produced Single-Stream recycling that is not bulky material, rubbish or hazardous belongs in the Single-Stream recycle Front-Loader container. This includes clean and empty plastics 1-7, food grade glass jars/metal cans, also paper products like copy paper, corrugated cardboard & envelope boxes are accepted.